While many might think that Bill Bruford and Patrick Moraz first played together in Yes, that's not true. They never played in Yes together. True, both of them were in the band, but at different points in the group's history. That, however, hasn't stopped them from recording a couple of albums together. This one has since been reissued with interviews and some bonus tracks, but I'm reviewing the original release here. Truly this will appeal mostly to fans of free form jazzy RIO, as there is a lot of dissonance and a lot of experimentation on show here. There's no question that both musicians are incredibly talented. There is also no question that they speak the same musical language. The only thing is, this is definitely not music for everyone. You'll note I have amazon.com links on this article. I chose to leave them there, but be advised that you can get the CD at a better price from Bruford's site. This one has a bit of a playful tone, but it's pretty meaty, too. It starts with a classical sorts of textures, but certainly moves into jazz sort of modes later. They do work their way back to the lines of melody that started the track later, though. They take it this time into the jazzy territory a lot faster, though. This gets rather involved, and is a very cool piece of music. It's a great way to lead off the CD. Beginning more tentatively with a bit of a mysterious air, this has sort an open progressive rock and jazz feel to it. It also contains a decent amount of dissonance, but a lot of drama, too. There are classical elements here, as well. The thing also moves out into some seriously odd territory, too - very RIO in texture. This one is a bit chaotic and dissonant for my tastes. It's sort of free form Crimsonian weirdness. This is a mellower piece. It's a lot less chaotic, although there is still a good amount of dissonance here. 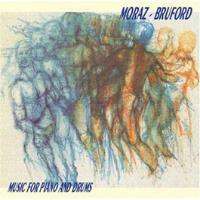 Besides Moraz' piano's melody lines, Bruford uses percussion to add to the feeling of foreboding and mystery. This turns more energetic later, and works back into the RIO sort of territory that makes up a lot of this album. Still there are also some very tasty, more melodic jazz moments present. Later on this turns into a rocking sort of jam that has one of the most full arrangements on show here. This one is definitely diverse and dynamic. Bruford's percussion starts this off very dramatically. This has an open, dissonant King Crimson like style to it in many ways. It's a bit odd, but also very tasty. I like this one a lot. That says a lot because dissonance often throws me off, but in many ways this is my favorite cut on the disc. It has a killer groove to later segments and is just plain effective. This is another dosage of seriously chaotic free form jamming that is very much in the vicinity of RIO. This comes in more tentatively with just piano in a pretty (yet dissonant) dissonant pattern to start. The arrangement fleshes out more later, but the cut also turns more towards the free form experimental territory, too. The more rock music oriented segment later is quite cool, though, with a nice melody to it. This definitely has its moments. Again the piano starts this one alone, but it's not by itself for long until Bruford joins in. Once again an open dissonant pattern pervades this one. In fact, this is one of the most chaotic pieces on the disc.